You can listen to a podcast review of this film below, or subscribe to Bina007 Movie Reviews directly in iTunes. I rather enjoyed the new Wikileaks movie, THE FIFTH ESTATE, despite its rather cartoonish characterisation of the two protagonists. Julian Assange is very much painted as an odd fish: egomaniacal, deceptive, paranoid, with a casual disregard for human life. By contrast, his early collaborator Daniel Berg, upon whose book this movie is partly based, is portrayed as a man of conscience and humanity. Where Assange wants to publish and be damned, arguing that THAT is the very mission of Wikileaks, Berg wants to protect innocent sources and take the time to do actual fact-checking. He sees the irony of Assange: a liberator of secrets who is himself secretive; a noble idealist who treats those around him ignobly; the man who would bring institutions to account, but is accountable to no-one. I'm not sure how much truth there is to such an account, and while it seems to mesh with other reports of Assange's idiosyncrasies and ego, one must also remember that he is subject to a smear campaign. What I CAN say is that it makes for a highly compelling movie, with every broad stroke characterisation over-ridden by the voyeurs joy at seeing inside (supposedly) the most important news organisation of our time. This is helped by a charismatic and note perfect impression of Assange by Benedict Cumberbatch, and another fine and sympathetic performance from Daniel Bruehl (RUSH) as Berg. I also thought that just as David Fincher found an imaginative way to present programming in THE SOCIAL NETWORK, so director Bill Condon (TWILIGHT: BREAKING DAWN) has found a really neat visual trick to show us how Wikileaks operates. He uses the metaphor of a room filled with old fashioned desks with computers and name plates. By showing us who is sitting at them., what they are doing, how they are being destroyed at various points in the film, he helps us understand the various shifts in power no the reality behind Assange's facade. I guess my frustration is that with the movie starting at the point at which Assange meets Berg, and given that our only view on his past is mediated by Assange, I'm not sure we get at the truth of what motivates him. He clearly had a weird childhood, to put it mildly, and maybe it's too early to really get the full perspective on what makes him tick. Still, as a biopic suffering from the fact that the sources only gives us one side of the story. THE FIFTH ESTATE, still manages to give us what seems to be an authentic and fascinating picture. It's well worth a watch. THE FIFTH ESTATE has a running time of 128 minutes and is rated R in the USA. 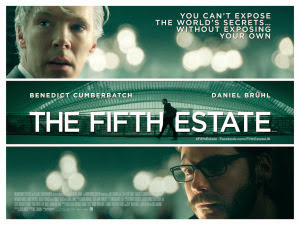 THE FIFTH ESTATE played Toronto 2013 and is on release in the UK and Ireland. It opens next weekend in the USA, Canada, Estonia and Lithuania. It opens on October 25th in the Czech Republic, Italy, Brazil, Finland, Poland, Spain; on October 31st in Germany and Norway; on November 8th in Australia, Denmark and Iceland; on November 14th in Argentina and Singapore; on November 21st in Belgium and Hong Kong; on November 28th in Greece; on December 4th in France; on December 6th in Sweden and on December 19th in the Netherlands.